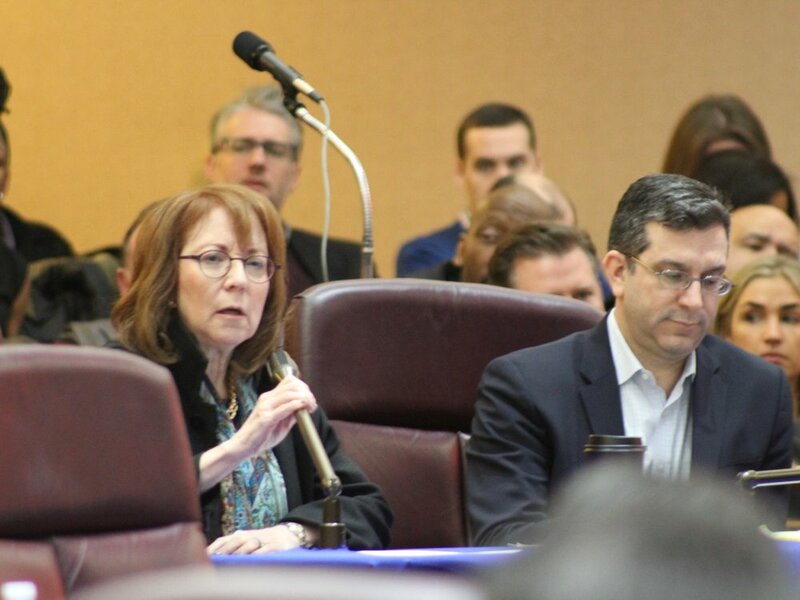 CHICAGO — The Chicago Plan Commission rubber-stamped the controversial Lincoln Yards development on the city’s North Side Thursday over the objections of community residents and two area aldermen calling for approval to be delayed. Although the three-hour public-comment period was dominated by neighborhood groups and local residents in opposition, with contractors and labor groups almost exclusively in favor, the commission voted unanimously 10-0 to approve the $6 billion development. It now must only clear the Chicago City Council on zoning changes to go forward. Many members of the Plan Commission are appointed by the mayor, and others — such as the department heads for transportation, parks, and planning and development — are also appointed by the mayor. Alderman Scott Waguespack, a City Council reformer whose ward is just west of the development, saw it coming early on in what turned out to be a five-hour hearing. “I know we’re going to have a vote today and this will pass,” he said. “I have no doubt about that. ”Public sentiment is extremely high against this development right now,” said Lincoln Park Alderman Michele Smith, whose ward is on the east side of the development. North Side Alderman Brian Hopkins, whose gerrymandered ward includes the actual 53-acre, $6 billion Lincoln Yards project proposed by developer Sterling Bay, was booed by a full-house audience that overflowed into a balcony gallery when he began to speak. The mixed-use project — including offices, residences, retail, and public open space — fills part of an industrial area including Goose Island that the city set for redevelopment two years ago. It will include 6,000 new residential units. Opponents took issue with how such a major project was only unveiled last July, with final plans for the commission to consider submitted only last weekend. Dozens of opponents in the public-comment period asked that the commission vote be delayed at least until after the February municipal election, to allow the next mayor after Rahm Emanuel and a new City Council to decide the issue — a position backed by most if not all of the 14 candidates on the ballot for mayor next month. Andrea Tolzmann, of the grassroots education group Raise Your Hand Action, said she was “deeply concerned about the fast-tracking of the Lincoln Yards project,” citing issues of government transparency and schools. She also pointed out the project includes a Tax Increment Finance district estimated to create an $800 million fund earmarked for new roads, walkways, transportation stations, and other infrastructure in the area, with the rest of the city’s taxpayers obliged to make up for that diverted revenue in their own property taxes. “This is just a rubber stamp,” said Juanita Irizarry, executive director of Chicago’s Friends of the Parks grassroots group. Many opponents said new details were being unveiled even in the commission meeting and called for a delay to take a more considered approach. “This process is tainted and must slow down,” said Amisha Patel, executive director of the Grassroots Collaborative, at a news conference before the meeting at Chicago’s City Hall. “Too fast relative to what?” Hopkins said, adding there’d been ample time and numerous community meetings over the last few months alone. “A delay would do nothing but take food off the table” for workers and contractors, said Jerry Lewis, president of JIL Construction. The project includes public parks on both sides of the river amounting to 11 acres of parkland. But in laying out the project and explaining the support of the Department of Planning and Development, staffer Noah Szafraniec repeatedly referred to how those were two parks, while Hopkins later insisted they were a single park connected by a bridge. The project drew flak from the owners of the Hideout, a small, independent bar with a flair for eclectic music bookings, located in the midst of the proposed development. Co-owner Tim Tuten, who has compared the bar’s future to the small house surrounded by skyscrapers in the Pixar animated movie “Up,” said plans were for a 65-story skyscraper across on the street, on a former city parking lot for garbage trucks, and a 42-story building next door. Co-owner Katie Tuten said, “Where are all the people, the community groups, in support of the project?” She pointed out those in favor were all contractors and labor groups figuring to get a piece of the action in the estimated 10,000 construction jobs to be had over the next decade. The Tutens were joined by Robert Gomez, owner of the clubs Subterranean and Beat Kitchen, and head of the newly formed Chicago Independent Venues League, organized around the Hideout in opposition to the development and its original plans for multiple music venues operated by the concert booking behemoth Live Nation. But Gomez said that Hopkins had told him the final plan includes music venues with a total capacity of 10,000, with the largest seating 4,500. Again, Gomez said, the details were so vague more time was required to nail them down and study the entire development. Others criticized how Sterling Bay was opting to use legal “in lieu” payments to reduce its commitment to affordable housing in the project. Frequent council critic George Blakemore later said, “This is going to be another San Francisco,” referring to how the tech industry has brought on a real-estate boom in that city. Alderman Walter Burnett, a member of the commission, asked to see a map of a three-mile radius from the Lincoln Yards site. “That’s half the city, isn’t it,” he said, quickly adding that he’d like some of that off-site affordable housing in his Near West Side ward. “This is a city issue,” said Alderman Ray Lopez, of the Southwest Side. “It is beneficial to the entire city of Chicago. “We have to move forward on projects that are transformative,” he added. Yet Smith drew parallels between the rush to pass the Lincoln Yards plan and the quickly passed — and soon regretted — plan to lease the city’s parking meters 10 years ago. But, after little additional questioning by commissioners when the public-comment period ended, the board voted unanimously 10-0 to approve the project. It now moves on to the City Council for final zoning changes. Those zoning changes are complicated, however, by an ongoing scandal rocking Chicago’s City Hall. Alderman Edward Burke has been indicted on federal corruption charges, and his law firm served as Sterling Bay’s real-estate attorneys on Lincoln Yards until just recently after the indictment was announced. What’s more, it was revealed this week that Alderman Danny Solis, chairman of the Zoning Committee, wore a wire in the Burke investigation. He’s resigning his post, and it’s not clear if he’ll be back to resume his duties ahead of the election.